Puteri's Musings: Would you drive this car? Would you want to drive this car? 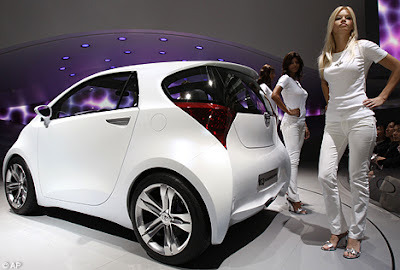 It is the Toyota IQ and the world's smallest 4 seater car at 9ft 9 inches long - about three inches shorter than the original Mini. I think I'll pass on the small and green cars for now. I will stick to my minivan. Hello Puteri, who would drive this car? Definitely not me. The car is only 9'9" long? Alamak oi! I am 6'1" and if my weighing scale did not lie to me this morning, I am 196 pounds, but assure you not looking like a woman at 6 months expectancy. Ha ha. If I get in the car, my feet will go into the engine kena bbq. I presently drive a Lincoln Town Car, with milage half way to the moon already. But love the car as feel like Incik Bill Clinton when in it, ha ha. My friends always ask me to switch to a newer one and I say, 'hey, Bill is sitting in a similar one'. Ha ha. When HE change, I change. But I like the two girls in your pic, whooohooo! Oh ya, read your reply to my Sarawak mention. Will try look it up in my old dairy one of these days. But have to edit and take out some chillie padis and sambal, arhaaa ha ha. You have a nice day, Puteri. UL. Wow, U.Lee at 6'1" you are taller than my ang moh husband! And no paunch?! Wah, I am impressed! Haha, your legs will indeed get bbq if you drive that small car, and probably develop a hunch from being cramped in there! Your old trusty Lincoln still going strong, eh? I didn't know Clinton drives a Lincoln, how you know? Aiyah, don't skip the chilli padi and the sambal when you write your longhouse entry!! The spicier the better! Heheh, guaranteed to increase your reader following!! My hubby and Nightwing want to read that entry too .. did you read their comments? You have a nice day too, UL! That's not a bag looking car at all. But if it was free, I don't mind driving it. But kena bayar car loan tiap2 bulan, have to think twice lah.. I'm like you, think more practically. Minivan is still my dream car. Cat, my problem is not with the looks of the car, but the size! But if given free, err, maybe I'll trade it in for a bigger car! Hahaha. You still working towards that minivan? I have one and my husband has one too. I bought my Dodge Caravan used, maybe I am the third or fourth owner? The previous owners didn't have it for very long. It started out as a rental car. My husband's is an old Voyager that his parents gave him. He uses it to work. We have never owned a new car, don't want to have to pay the hutang, yunno. My in-laws also gave us their GMC van, Tiara, still in very good condition. Large van, but it is not insured right now since we are not planning to use it any time soon. Just sitting there collecting dust on the driveway! Actually, most SUVs and older vans are generally more unsafe to drive, but give a sense of safety as you've described. What I do know that is that most women, like you, prefer something big that seats higher up. This also happens here with many housewives driving 'Ninja Kings' around town. As 'eco-minded' that Toyota IQ you've shown is, it's still a superdownsized car that won't fit most of what we need to fit in it, perhaps appeals only in the streets of Europe. As you've said, a minivan is probably a best choice, since a lot of them are very safe now. Hello Puteri, feeling sleepy so thought I take a peep at the two girls in your small car pic for a wakeup call, arhaaa ha ha. Re Bill Clinton in a Lincoln T/C, he is being driven in one, wheres I drive one. Ada difference, ha ha. (by the way, I hope Hilary wins the Presidency, first lady president, but I also like Fred the actor.) Pity my wife scared of driving, she, "no way I'm going to drive that monster"! Ha ha. I bought my Lincoln used too from an old guy his eyesight not good at looking at young girls anymore let alone drive 'that monster', ha ha. Everytime we get Malaysian relatives, in-laws and out-laws come here for visit and I pick them up at airport, they tend to walk around my car do two laps like Michael Shumacher at Le Mans, ha ha and their comments, "alamak, SO BIG la your car, how you gostan lidat"? Arhaaa ha ha. Re my Sarawak escapades, heh heh, Might need PGA rating. Hey, it was 5 days and nights in an isolated long house, and the grandson telling his grandfather the big chief, I bigger chief as got more people in many areas, ha ha. *wink* There were a lot of young and matured widows, I guess maybe from hunting accidents or whatever. I was hoping more rains would fall, river flood go higher stay more nights, *wink*, ha ha. PS, which one your handsome hubby? I see two names, one here, besides James Bond? Ha ha, just kidding. It's not even noon, and you are sleepy? Heavy night, ah U.Lee?! Dunno if I'll ever own a fancy car like a Lincoln! My pockets not deep enough. Pity. hahaha. Now you are whetting my appetite even more. Widows are involved in that longhouse story?! Come on, write that story soon! Put a rating or whatever, just write it and no skimping on the details, pls! Haha. My hubby's call sign is douglas210. Ya, he wants to read your story too! I don't know, Ian, SUVs are most definitely safer here .. maybe it is the impression of the size? In any accident involving a SUV and a regular car, of course the SUV comes out the winner in that. The Ford Explorer had a bad rap at one time because of the tires .. there were a lot of self accidents because the tires blew. I have not heard about it since then because Ford changed used tires from a different manufacturer after that. Maybe for places where it rains a lot, the hydroplaning issue might be sth that must be taken into consideration. I think what is important is that the consumer makes an informed choice when buying a car. There are safety test records about any car that is on the market that you can check out, and if safety is your utmost concern then buy a car that is the safest in your opinion. Our friend, Richard, buys his cars based on the results of saftey tests. We don't. Heheh, maybe we should since we have young kids driving in the car with us. In Miri, I don't see why people need to drive those huge cars. If you drive far in it, maybe but for around town? It is more a status symbol than anything! My brothers have their full sized SUVs, and they don't drive very far in it, except once a year when they go back to the longhouse with my parents. Ya, like you said, in Europe they love their economical little cars. Not in the US though. I like small cars for economy but that one is too small except for short trips on suburban streets to the supermarket. I've ridden motorcycles so I know what it like to feel vulnerable. At least on a bike you are very nimble and can go fast enough to stay ahead of other vehicles. We could afford a new vehicle but our "secret" bank account is being kept for home improvement and emergencies. Also, it isn't economical to buy new when so many good used cars are available for a LOT less. Best deals are for about 1 year old cars. They're probably 2/3 the price they sold for. U. Lee, please keep up the good stories on longhouse hospitality. You make me want to take a long visit upriver. Only problem is Puteri won't let me! At least not without her along as chaparone.